The observational daily station data for the VALUE experiments has been extracted from the ECA&D public (downloadable) archive on 15/9/2014. Summary: The final list of 86 stations selected for VALUE Experiment 1a is described here (an Excel file including IDs, longitude, latitude, elevation, country, Koppen climate type, comments on the stations, and the names of contributors). Version 1 (21/12/2014) prepared according to the VALUE text format for station data and can be downloaded as a zipped file [VALUE_ECA_86_v1.zip]. The data covers the period 1961-2010, which includes the analysis period for this experiment: 1979-2008. Version 2 (17/4/2015) [VALUE_ECA_86_v2.zip] prepared correcting a number of outliers and inconsistencies detected in version 1 which have been re-coded as NaNs in the new dataset. 000214 (LISBOA-): -16.9 degC (this record is out of the VALUE analysis period). Description: Initially we focused on temperature and precipitation for Experiment 1a (see Maraun et al. 2014). A preliminar analysis of the downloadable (blended) ECA stations with no more than 5% of missing values in the analysis period (1979-2008) resulted in 786 stations with data for both precipitation and temperature (2274 for precipitation and 948 for temperature) with changing density across countries (the data was downloaded from ECA&D on september 2014). These stations are shown in the following map and are listed here (Excel file, including the ID, name, lon, lat, and country, using ISO 3166 Country Codes). Note that some of the ECA&D series are private, resulting on an inhomogeneous coverage for public data. The following map illustrates this problem (downloadable data is represented by geen dots). This map has been produced using the ECA&D data availabilty map tool, which allows to graphically browse data availability. The goal for Experiment 1a (station data) was selecting a subset of stations covering the different european climates and regions with a homogeneous density, building on high-quality stations to avoid inhomogeneities as much as possible (including problems arising from the blending process in cases with several neighboring stations). Expert feedback was requested from VALUE members in the different countries, obtaining the final set of 86 stations shown in the following figures. In order to illustrate the climate and geographical diversity of the set of stations, the figures below show the station IDs and the corresponding koppen climate types (top), and the elevation of the stations (bottom). VALUE_ECA_86 is a subset of the downloadable ECA&D blended series. The policy of the ECA&D dataset is given here; in particular the following acknowledge has to be included when using this dataset: “We acknowledge the data providers in the ECA&D project. Data and metadata are available at http://www.ecad.eu”. Moreover, the following paper has to be cited: "Klein Tank, A.M.G. and Coauthors, 2002. 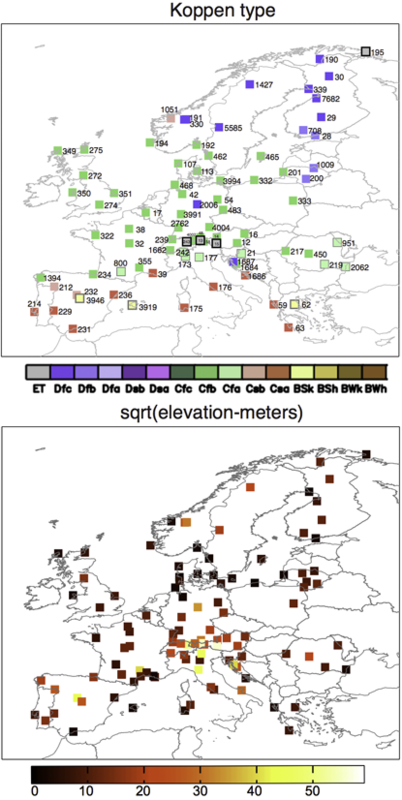 Daily dataset of 20th-century surface air temperature and precipitation series for the European Climate Assessment. Int. J. of Climatol., 22, 1441-1453."